“We’re here, Grandpa,” said Billy as the car came to a stop. “Okay,” John said as he undid his seatbelt. “But we don’t have to spend a lot of time here.” He got out of the backseat and followed Billy, Mary, and Tom to the ticket line. After a few minutes, John raised his head and looked at the WWII battleship sitting moored and ready to take on tourists. His thoughts went back to a 1943 naval yard. Hot standing on the dock waiting for boarding. “John Pulaski reporting for duty.” Salute given and returned. “Get onboard, Ski,” said the officer of the day. As Tom handed him a ticket, John felt as if he were in two places at the same time. “Let’s go, Dad,” said Tom. John and his family started up the ramp to the ship. Salty air. Cool ocean breeze. Ship underway. “Oh boy! 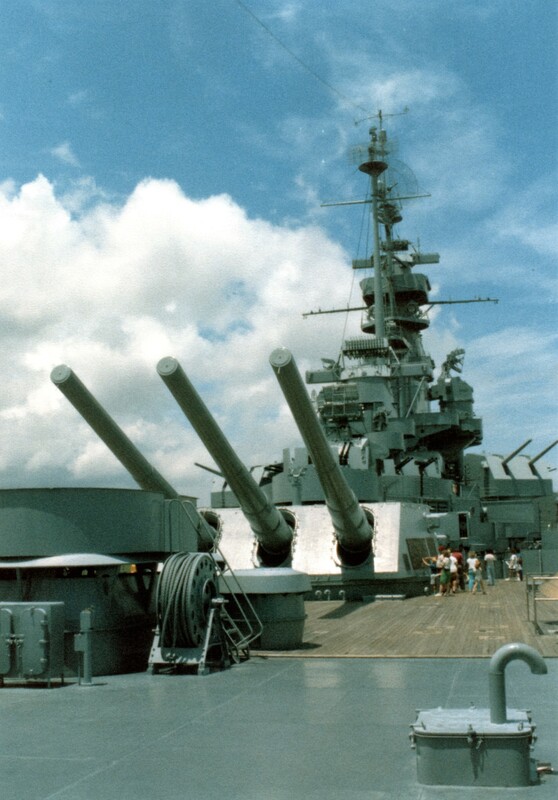 Look at those guns,” said Billy as they toured the deck. Bombs exploding. Metal twisting, jarring. Smoke filled corridors. Choking, coughing. Climb up the ladder. “What does that plaque say, Billy?” asked Mary. Guns firing. “Lead, dammit! Lead!” Blood on the deck. “Let’s go look at the plane,” said Billy. Two airplanes down. One to go. It turns. Heading straight in. Bodies in the water. Our guys and theirs. Smell of hot metal and burning flesh. I could visualize, from your writing, what was happening in your story. Thank you, Yibbity! I appreciate your comments and interest in the story. Sue, your interweaving the grandfather’s thoughts with the family’s touring the warship was riveting. And the family being oblivious to what he was feeling is heartbreaking. Thank you, Barbara. I think it’s important to be sensitive to the experience of our veterans both young and old. Sue, I enjoyed the internal conflict in your piece and the exchange of trivial photo taking and gift shop purchases with the vet’s trauma.